I purchased an Alienware 14 about a year and a half ago and i have been loving everything about the computer. It runs everything i throw at it, is made very well and has been having absolutely no problems... unitl now. I was recently laying in bed browsing the internet, when randomly both my alienware and power cord completely lost power. When i say that they both lost power i mean that my screen went black, the light by the power button that is usually lit up when plugged in had no color, and my power cord that usually has a blue light around the tip to show that its receiving power went off too. This was really weird to me, especially relating to the power cord, because even when ive unplugged it in the past, the blue light would slowly fade away and not immediately go out. My initial reaction was that my electricity went out, but throughout this whole ordeal i had a fan running on the same power strip with no problems. This leads me to believe that my power cord shorted out while plugged into the computer and likely fried something internally. As a side note, i put my voltimeter on the power cord and as soon as i touch the outside ring and inside prong the power cord completely dies (the light turns off immediately) just like when my computer died in the first place. Since this happened, ive tried: a power cord from a friends alienware laptop, leaving it plugged in all night, taking the battery out with the power cord plugged in, taking it apart piece by piece and checking for any obvious signs of a problem, and blowing out the computer. All to no avail. I know i can purchase a replacement power cord as well as the motherboard power harness easily enough but before i shell out additional money I want to make sure this is going to fix the problem (which i don't believe it will). Can somebody give me some advice on what my next course of action should be? Of course its out of warranty (even though i emailed dell about extending the warranty months ago and never heard back), so i'm a little scared of sending it in for service because i'm sure its gonna cost a lot of money to fix. However, if thats what i have to do then so be it. Thanks for any help and reading this really long post. 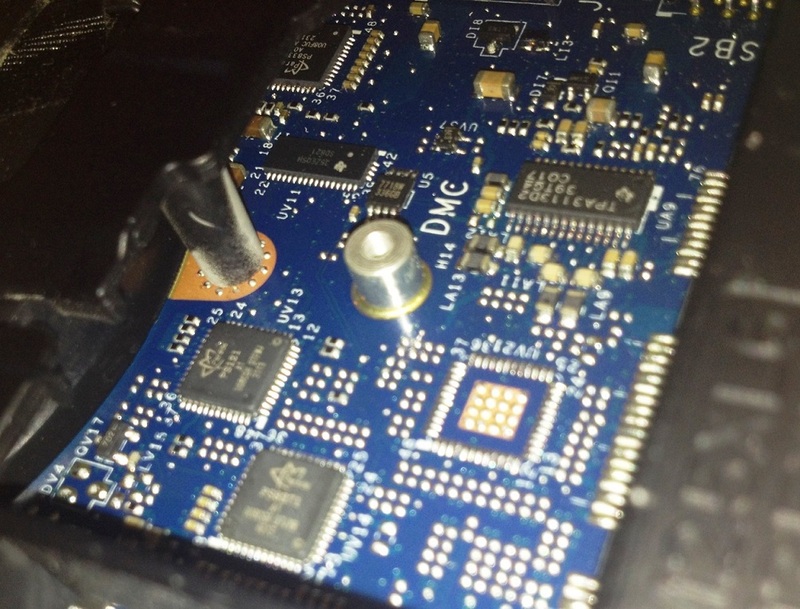 The DC jack would be the next part to replace - if that doesn't solve the issue, the mainboard is the faulty part. Hey EJN, thanks for the help! Before i purchase a new DC jack is there a way i can test to see if its working properly? Also, i disassembled it again today and noticed what might be a blown cap. i know its not the best pic but the cap that is under the black plastic (on the top left) appears to have leaked. I'm not the most knowledgeable with electronics but is that what i think it is? It does look damaged -- if that's on a small board, that (the board) would be the part to try replacing. If it's on the mainboard, it may be less expensive to find a true repair shop that can replace just that component -- it will be less expensive (probably on the order of $150) to have the soldering done than to replace the entire mainboard. What was the solution? It looks like a capacitor overheated and failed. There are some technicians who repair this type of problem offering their service on ebay. I have had a few computers over the years die this way. Most laptops are designed for operation in air-conditioned workspaces with temperatures less than 75F. Graphics intensive applications produce a great deal of heat, often more than the internal fans and heat-sinks were designed to handle. I'm having the same exact problem with mine, i have less than a year with mine and I was just starting a game match just as usual and happen the same to me and I don't know what's going on if you can tell me if you fixed or not that'd help me a lot thanks.